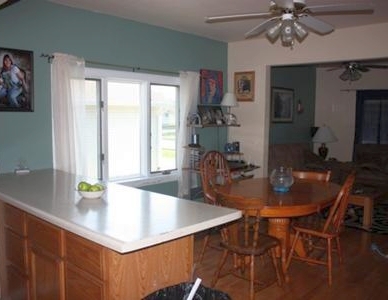 When you have an open concept living room, kitchen and dining room, painting in color can be difficult. In our case, trying to tie in all rooms required the help of the staff at a local hardware store. Taking into account our current décor and the new furniture that was on its way, the workers helped me decide what color to add to the room. The room had been all beige and I wanted some “color” in the room, something different but at the same time something that didn’t stand out too much. My original color I was going for was a deep burgundy, however after looking at colors I went with a shade of green. Green is not one of my favorite colors but it worked so well in my space that I painted more areas green. My whole space is not green, just the south walls of the rooms are green, along with the east wall that is home to the patio door. 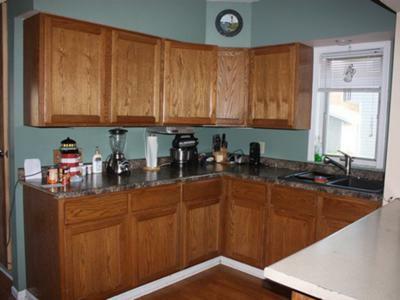 The area under the kitchen cabinets and above the counter is green also which went against the south wall rule. This isn’t an ordinary green; it is kind of a dusty green. It brings out the brown in my furniture and the black in my counter tops. We went with a semi-gloss paint by Glidden for the walls and a flat paint for the ceiling. The ceiling color was a lighter version of the main beige wall color. The trickiest part of the painting process was the corners of green and the beige color of the opposite walls. Getting a straight line was difficult and took a great deal of time and concentration. In the end I love my space; it added just the right amount of color and gave the areas the effect I was going for. My husband had his doubts on painting one wall in each room green, and thought it would look weird, but in the end he loves it too.